If you’re looking to revamp your kitchen yourself then you should check out the ‘Complete by BA’ range one of our supply only options. The range offers a comprehensive package of kitchen cabinets ready for tool-less assembly, pre-assembled Hettich soft close drawers & hinges with pre-drilled doors and drawer fronts. 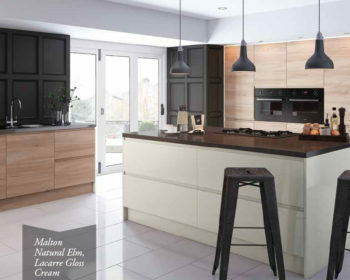 You can choose from 3 cabinet colours and 16 door options. Making it the perfect cost effective option for do-it-yourself installation or for contractors. The UNICLIC technology is a tongue and grove solution which enables a click connection at an angle of 90°. This revolutionary technology makes it possible to assemble flat packed kitchen cabinets by simply clicking the components together, without requiring any tool, screw or glue! The Click connection is stronger than a traditional assembly system as the joints interlock along the entire assembly length instead of only on 2 fixing points. As there is no fittings required with UNICLIC the technology is completely invisible. We currently have a display in our showroom 241-243 Seaside, Eastbourne East Sussex BN22 7NT so for more inspiration and information pop in or call us on 01323 301606 to discuss your individual requirements.